Rohit tried to shoot a video of Manish Pandey in a professional way. India's limited overs vice-captain Rohit Sharma picked a camera instead of the bat before the start of Australia's tour. Rohit turned himself into a cameraman and shot an intro video for his teammate Manish Pandey. "MUST WATCH - When Hitman became Cameraman ???????? 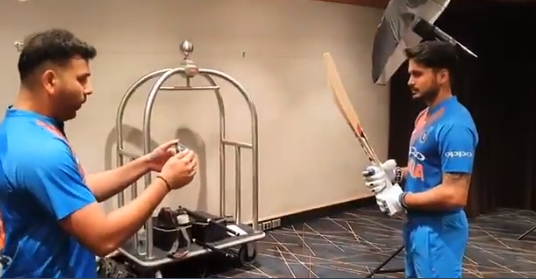 We get behind the scenes as @ImRo45 goes behind the lens to profile @im_manishpandey during a photoshoot - by @28anand," wrote BCCI while posting the video. MUST WATCH - When Hitman became Cameraman ???????? Rohit may have done a good camerawork but his batting wasn't up to the mark in the first T20I against Australia which India lost by 4 runs. The opener was dismissed early in a chase where India needed over 10 runs per over to win the game.